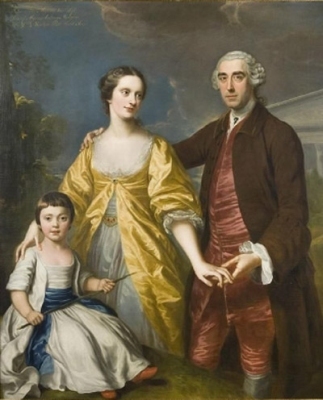 George Kenyon, 2nd Baron Kenyon, Baron of Gredington was born on 22 July 1776.1 He was the son of Lloyd Kenyon, 1st Baron Kenyon, Baron of Gredington and Mary Kenyon.2 He married Margaret Emma Hanmer, daughter of Sir Thomas Hanmer, 2nd Bt. and Margaret Kenyon, on 1 February 1803.1 He died on 25 February 1855 at age 78. Her married name became Bullock-Marsham. Her married name became Style. Children of Emily Eleanor Marsham and Sir Charles Fitzroy Maclean, 9th Bt. [S21] L. G. Pine, The New Extinct Peerage, page 149. Her married name became Coker. [S40] L. G. Pine, editor, Burke's Genealogical and Heraldic History of the Landed Gentry, 17th edition, (London, England: Burke's Peerage Ltd, 1952), page 487. Hereinafter cited as Burke's Landed Gentry, 17th ed. [S21] L. G. Pine, The New Extinct Peerage, page 177.